While I may not be in the Halloween spirit too much this year, the least I can do is pop on a bold and striking nail polish. This week's polish is the Sinful Pro Shine nail polish in Show Off...what could be more fitting? Sinful isn't a brand of polish that I'd heard of before until they appeared in my Nailbox subscription box last month. Not to be confused with Sinful colours though the similar names can be quite confusing! 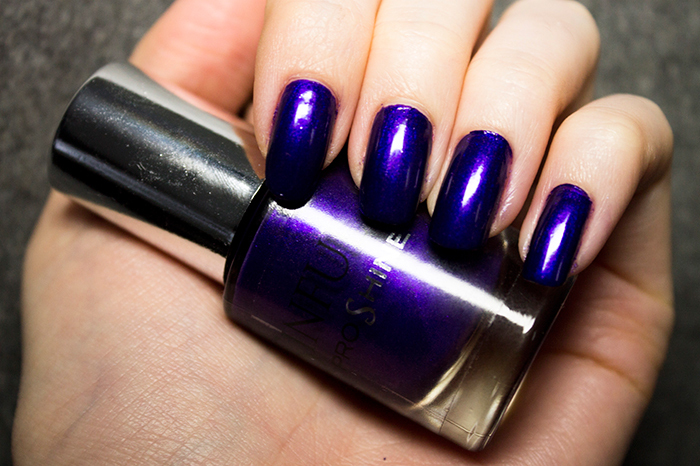 Show Off is a gorgeous deep metallic purple which definitely lives up to it's name. It's a pretty good dupe for Rococo's No Shrinking Violet too. The polish itself was very easy to apply, two coats is all you need and it dries quickly into a lovely glossy finish. Sadly the gorgeous colour can only do so much as the polish doesn't last very long on the nails at all. After around 2-3 days I find it chips easily in large chunks so there's no saving it once it's done. At £7.95, the longevity and quality of the bottle just doesn't meet expectations.